Discover the Exact Step-by-Step Solution to Get Rid of Skunk Odor Once and for All! You're about to learn exactly how to remove skunk smell from anything as quickly as possible. You may feel like you've already tried everything to remove the burning overwhelming stench from the local skunk but THERE IS A SKUNK SMELL REMOVAL SOLUTION with common household items. 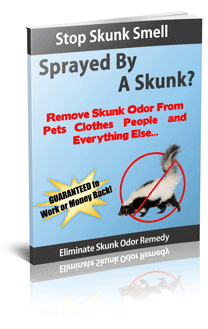 This Guide Has Helped Over 1,000 People Solve Thier Skunk Odor Problems! Over 1,000 people have solved their skunk odor problem by following the steps in this easy to follow step-by-step guide. 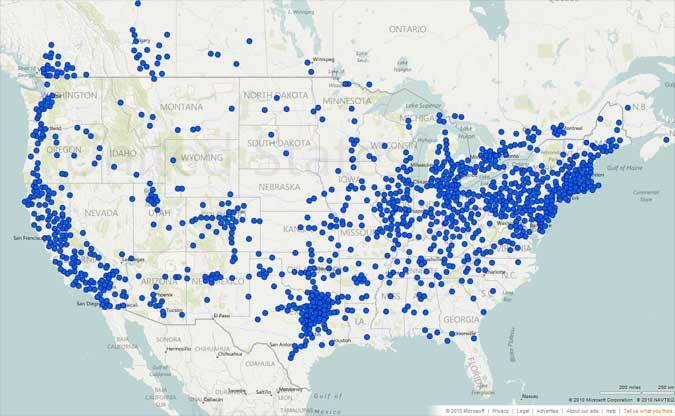 Below is a map where my skunk smell removal guide has been downloaded and used. Of the thousand people who have read my guide a whopping 95.45% were able to get 100% skunk odor free. Only 4.55% were unsatisfied. Based on this, I can confidently say that my guide's formula will help you to solve your skunk odor problem, or I will give you your money back! In A Hurry to Remove the Skunk Smell? Click on the button below to go to our Secure Order Form to Download My Skunk Smell Removal Guide. Did you know that it takes up to two full weeks for the skunk smell to go away if left untreated, and that over 50% of people who have a pet sprayed by a skunk take their pet to get treatment because they can't wait two weeks? 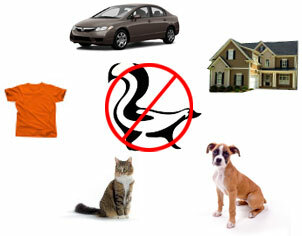 There's no need to go out and buy harsh chemicals, specific shampoos, or hire a pet groomer to get rid of skunk odor. You can easily remove all of the skunk smell with common ingredients found in just about every home! Plus, you will also learn how to keep skunks away from your home so you can prevent them from coming in contact with your pets, home, and family ever again! You would be surprised at the unusual things that skunks are attracted to that most people have in their back yard. Against what most people believe, using tomato paste or tomato juice doesn't work at all! What really happens is that when you apply the tomato juice you're so close to the source of the odor that it overwhelms your sense of smell and causes your body to stop smelling the odor (olfactory fatigue). So once you apply the tomato juice all you can smell is the tomatoes! People who apply tomato juice swear it works because they can't smell the skunk anymore. But anyone not exposed to the skunk odor will quickly verify that they can still smell the odor. Most People Try Skunk Smell Removal without Knowing What They're Doing...And This Just Makes A Bad Situation Worse! This includes using soap and water to try to remove the smell! Even though soap, shampoo, and water may seem like a good idea at first; all it does is re-activate the odor and spreads it around so it actually makes it worse! This is why it's not a good idea to use free information found on forums, blogs, and websites. What to do after you realize your pet has been sprayed by a skunk. Failure to do this step can make the skunk smell even worse and can even cause it to spread! The easiest most effort free way to get skunk smell out, forever! Make the mistake of brining your sprayed pet inside your house? Learn how to get the inside of your house Skunk Odor Free quickly and easily! Simple easy-to-follow instructions to have your pet smelling better than before they even got sprayed by the skunk. A commonly overlooked step revealed in Skunk Odor removal that is left out of 90% of the top skunk odor removal resources. Detailed information on keeping and preventing skunks from ever coming near your pets or house again. Run over a skunk in your car? Learn how to remove the embarrassing skunk smell, and no a car wash doesn't work. Methods no one should ever use to remove skunk odor. You'd be surprised at the dangerous methods and lack of instructions people are spreading around blogs and forums on removing skunk odor. Some of these methods cause permanent bleaching and even blindness! How to know if your pet or someone else needs medical attention because of the Skunk Musk. In-depth information about Skunk Musk itself. Rest assured that this homemade skunk smell removal formula has successfully worked for over 1,000 people. It takes just 5 minutes to prepare and in no time you will be skunk odor free! As I said earlier, over 95% of the people who tried this same formula were able remove the skunk odor in countless different situations. So, How Do You Remove Skunk Smell? If you want to completely get rid of skunk odor, you have to take action... Your skunk odor problem is not going to solve itself anytime soon. Wait the two weeks for the odor to disappear. If the skunk sprayed something outside and the next 14 days are going to be dry this could be an option, as long as the wind doesn't blow the odor inside your windows or near your air conditioner. Search the internet for a solution. This is the first thing I did when I had this site built. I didn't find any website with the same formula I use, and most of the formulas were dangerous or copied from other sites. A few of the sites I found had the same ingredients I used, but they used the wrong amounts and told you the incorrect method of using the formula. There is a quick and easy solution that works and has helped hundreds of other people in the exact same situation as yourself. Stop Skunk Smell Contains the step-by-step instructions on how to solve your skunk smell problem. In as little as 10-20 minutes from right now, you can be on your way to being skunk odor free! If you're ready to get rid of your skunk smell and enjoy the rest of your day knowing the problem is solved, then take advantage of Stop Skunk Smell's easy, step-by-step, risk-free skunk smell removal solution. Download Today for Only $39.99! Midnight and the price is only $23.99! Yes, I am ready to be Skunk Odor Free. Let me try Stop Skunk Smell for 60 days and if for any reason I am unsatisfied I will receive a full refund. Don't Hesitate, Download Stop Skunk Smell today and get rid of all skunk odor once and for all! You can get full access to this powerful formula in as little as 5 minutes from now and I'm offering a full 60-day guarantee, you have nothing to lose! P.S. 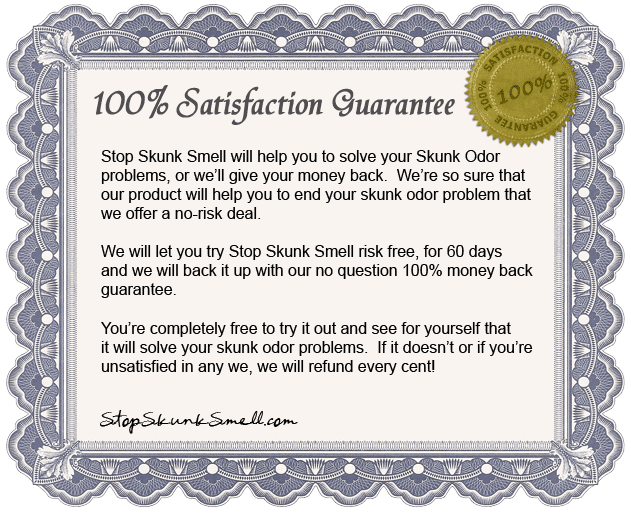 - Remember, Stop Skunk Smell comes with a full 60 day money back guarantee so you have 8 solid weeks to try all the step-by-step solutions to remove skunk odor and if you're unsatisfied in any way I will give you a full refund with no questions asked. Stop Skunk Smell for $23.99 While the Offer Lasts! Once you click to download/order Stop Skunk Smell you will be taken to our secure online order from. After you complete the order form you will be taken to our secure download page where you can download Stop Skunk Smell in .PDF format or you can read them and/or print them directly from our webpage. To learn more about how we determined time estimates for removing skunk smell odors and to learn how we determined product use locations, please see our FAQ page. I shared the step-by-step information with my son to help them get the skunk odor washed out of their dog. You know, no matter how old your kids get they still think mom has ALL the answers. So when they called I immediately googled the problem (go figure that I would be the one to think to search the internet for the answer. haha) Anyway turns out I'm the hero. Every step you outlined was followed EXACTLY and "waalaa" skunk smell all gone!! Short an to the point !! we got home read the directions mixed it up the dog was in the back yard and we took the bucket out there and went to town on her, we were a little concerned about getting the solution in her eyes and I think that was the only spot we did not do 2 times. Well after the pissed off dog finally got her scrubbing she shook all over and we put her in the laundry room to dry. 2 hrs later the wife came home and right away as she always does opened the door and let the dog run the house, we were yelling at her and she said whats the problem ? I don't smell anything ! BAM !!! It worked ! Your solutions worked extremely well. It amazes me just how bad it is when you get sprayed by a skunk. When it initially happened I asked my husband if he could smell anything on me and he said no, so I went to work. What a mistake. By 1:45 in the afternoon they asked me to leave and go home that is how bad I smelled. It had spread throughout the office. Your solution worked very well. I am the joke of the office this week. The formula worked even though we did everything you said not do to at first. Although we did not let the dog run through the house, my wife picked him up and took him to the tub. There is still a little stench on my dog's beard, but it seems to be going away quickly. Thanks for the advice. Our dog was sprayed in the face by a skunk Fri. evening. I immediately went on line for advice. I'm glad I did. I had my husband pick up the ingredients on his way home and we were amazed by how quickly the odor almost disappeared. We would definitely recommend this because it helped us through a stressful situation. We already have back-up supplies ready to go, but of course we hope we never have to use them! Our dog got ahold of a skunk and got sprayed. Of course she smelled terrible. Your solution worked wonderfully. Only one treatment and she is smell free. We were surprised the way she smelled after just one bath. I have already recommended this to several people. I can't tell you how pleased I was with "Stop Skunk Smell" It was money well spent. It was inexpensive and very effective. Not only did you help me get the smell off all 3 of my dogs that were sprayed by a skunk at 5:30 am, it also got 99% of the smell out of my house as well. I really took comfort in the additional advice about what to expect and look for in my dogs behavior after being sprayed. It is a very educational piece in many ways. I have recommended it to all of my friends and co-workers. I work in the animal field at a Shelter and I also breed dogs, so this book is very valuable to me. I was amazed that I had all the ingredients I needed to rid the skunk smell from all 3 dogs, my house, and my clothing, right in my home. Stop Skunk Smell saved me lots of money, time and aggravation. I was leary about purchasing it at first but figured I had nothing to lose with it's money back guarantee, and I was desperate for an immediate solution. The best thing was that it was immeditately downloaded to my computer unlike ordering some of the other products on the market. I needed something fast and this was fast, effective and cost effective. Thank you again for helping me and my three Boxers. They were so happy to come into the house that afternoon and be with the family again, skunk free! What a great product. Obviously when your dog gets sprayed at 11:30 at night, it is a little stressful. With the help of your product and a late night run to a 24 hour grocery store, we were able to remove the awful smell of the skunk. Deisel, our german shepard, did not get a direct hit from the skunk, so it only took one application of the solution. Your product was well organized and easlily understood, even in the twilight hours. Deisel and I would like to thank you.